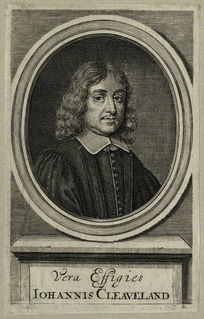 Clievelandi Vindiciæ, or, Clieveland's genuine poems, orations, epistles, &c. purged from the many false and spurious ones which had usurped his name, and from innumerable errours and corruptions in the true copies : to which are added many never printed before, with an account of the author's life, 1677, London : Printed for Robert Harford at the Angel in Cornhill near the Royal Exchange. Cleaveland [Cleveland] (no work cited); concorporate; drowsy; drone (1773 Dict. ); (about 50 cites in vol. 1); laird; lancepesade; (about 98 cites in vol. 2); nibble and a few other citations are to Cleaveland's Poems.